Most people only ever use a lighter for smoking cigarettes. Some enterprising souls find other uses. 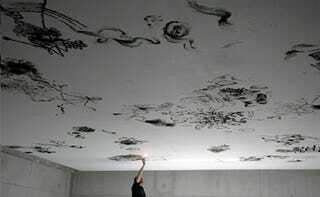 But for Parisian artist Oliver Kosta-Théfaine, the BIC lighter is his paint and the ceiling is his canvas. Kosta-Théfaine, armed only with patience and a lighter, burns intricate patterns into ceilings for his art.